The Great Gatsby by F. Scott Fitzgerald is one of the few books that I decided to pick up just to get a taste of classic American Literature of a bygone era. My expectations were minimal and contrary to my usual careful dictum of ‘read the blurb and then only pick up the book’, I purchased it on an impulse and I had absolutely no idea as to what the novel is going to be about. Probably minimum expectations translated into maximum satisfaction, as in the beginning itself, I was quite impressed by the beautiful poetic language, practical down-to-earth allegories and a unique tolerance towards moral ambiguity, expressed by Fitzgerald in one of his most famous novels:The Great Gatsby. The novel begins with a few pearls of wisdom shared by the narrator Nick Carraway – a young man, chasing the famous American Dream of prosperity and success with an anxious zeal. He goes to East to learn Bond business, and ends up in one of the strangest localities of North America named West Egg. The locality is not only egg shaped, but even has another similar formation called East Egg on the other side of bay. West is considered a little laid back, while East is fashionable, a hub of well-heeled socialites. Little does Nick know that he would end up as the bridge between the lives of Westeggians and Easteggians, bringing them closer, and acting as an emissary of not just love, hate and jealousy, but also a witness to bitter quarrels and murders. The novel is essentially a summary of extra ordinary events that happen during the three months of summer spent by Nick on Long Island shore, adjacent to New York. The narrator is a man of reserved judgements and is often entrusted with secret griefs of wild, unknown men and it is his capacity to keep secrets that lands him in trouble in West Egg. Nick has a cousin Daisy Fay, who is married to Tom Buchanan of East Egg, a long lost friend of Nick himself. As is predictable, he goes to meet Tom and Daisy and inadvertently becomes a part of their lives and before he could even understand, Tom introduces him to his mistress, Myrtle. Tom and Myrtle are having a secret love affair in New York, keeping their respective spouses in dark. While Nick is in dilemma whether to let Daisy know about Tom’s affair or not, he himself gets embroiled in a controversial affair with famous golfer, Jordan Baker. Next door to Nick, lives a flashy young man, Gatsby, who is famous for throwing lavish parties every weekend. For some unknown reason, Gatsby is adamant to be Nick’s acquaintance. Nick meets him in his party and slowly becomes a good friend of Gatsby, who comes across as an easy going person, an Oxford literate and a war veteran. However, soon Nick gets to know the real reason behind Gatsby’s warmth, he is an ex-suitor of Daisy and is still madly in love with her, and has apparently moved to West Egg just to get an opportunity to meet her. And, now Nick is expected to bring Daisy in contact with Gatsby! So, in an ironical way, Nick becomes involved in extra marital love affairs of both Tom and Daisy. And, it takes quite an effort on his part to handle both the roles easily. What would happen to Tom and Daisy’s married life? Would Nick be able to reconcile their differences? 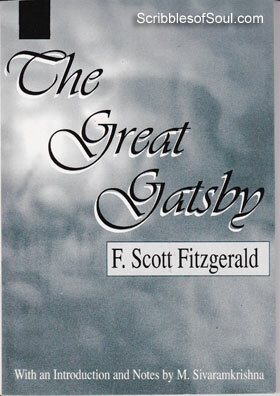 Would Gatsby be able to fulfill his long-lost dream of having Daisy as a companion, or would his golden dream shatter in the wake of stone faced reality, are some of the questions, I expected Fitzgerald to answer in his 145 pages long classic novel, The Great Gatsby. While reading novel, I felt that the story is an oft repeated one, with an innocent poor man falling in love with a beautiful rich girl, who spurns him for more worthy suitors, leaving our Hero seething with anger and desperate to get rich, resorting to illegal means. But, in retrospect, I think, all the classics usually suffer from a serious handicap, in the sense that they had already inspired one or the other film maker or writer, and as a result the story appears repetitive, reminding you of some movie. Obviously, you are not the first one to read the book, or to be inspired by its powerful narrative, it has already been adapted into hundreds of novels and movies, and as a result, the story does lose some of its freshness, and appears more as a formula film, that you had watched. On this account, The Great Gatsby is no exception. However, a classic is nothing if not extra ordinary. The soul of a novel lies in its narrative and Fitzgerald excels in this particular field. He has laden the narrative with juicy sarcasm, witty humor and brilliant symbolism. And, I feel that the rich artistic style is sufficient to keep ‘The Great Gatsby’ on classic shelf for a long time, a good story is just an icing on the cake. Fitzgerald was able to suffuse life in even inanimate objects by his creative imagination, leave alone his main character, Jay Gatz. Jay Gatz aka Gatsby is one of the most likeable bad man. Though, I knew that he is running after an impossible dream, his way of life as a racketeer is wrong, his mad desire to love Daisy is suicidal, yet I wanted him to succeed and did not want to accept his tragic end. For me, the author was able to create a well rounded man, who is shrouded in mystery, and is all the more attractive for his hidden persona. The narrative was easy flowing and yet dramatic, doing justice to a well written story. Contrary to all my expectations, Scott changed the story drastically in last few pages, and I was left gasping for more. The moment, I felt that the narrative was dwindling, the writer brought a new twist, renewing my faltering interest. All in all, The Great Gatsby is a good classic read, with its vast retinue of affable Nick Carraway, saucy Myrtle, careless Tom and Daisy and dashing Jay Gatz, who remain fresh in memory long after the book has ended.